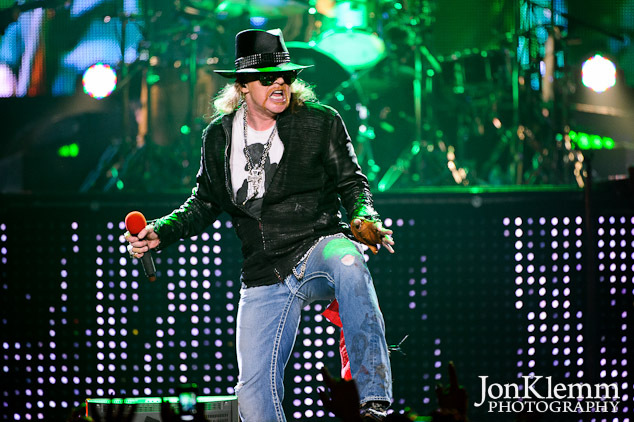 While there is speculation and hope that the original lineup of Guns N’ Roses will reunite for the Rock and Roll Hall of Fame induction ceremony this summer, Axl is keeping his chops up by touring with his current version of the band. It was just announced that they will be playing three shows in New York City in mid-February.They were last in the NYC area in November, when they played at Izod Center in New Jersey. A gallery of photos from the Izod Center show can be seen here. This entry was posted in Concert Photography and tagged Guns N' Roses, Izod Center.